“They had the same superstitious feelings as the Indians of Uxmal; they believed that the ancient buildings were haunted (p. 14). . . .in regard to this building [the Eglesia (sic) at Chichén Itzá] that on Good Friday of every year music is heard sounding” (p 118). There are few references to religion or beliefs in spirits or ancestors in Stephen’s book. Scholars are already well aware of the syncretism at work between Mayan and Spanish Catholicism. Our trip to the Yaxkin Spa at Hacienda Chichen Itza illustrated how syncretism is a continual process that is part of the reinvention of cultural traditions in all societies (www.yaxkinspa.com/). It also taught me about how tourists learn about today’s Maya. Quetzil had told us that this Spa was created entirely for tourists, that there were no Maya “elders” to legimitate the Spa’s claims of roots in ancient healing traditions and that the entire ritual was an invention. I also knew that in all the ethnographies I have read for Maya societies, traditional healers are almost always male. I carried this information with me as we arrived at the ritual site. After checking with the desk in the porticoed entrance way to the hotel’s patio, we were escorted down a path to the single room building set off from the main house and surrounded by flowers, ferns, and a variety of palms. We were introduced first to Ix’men Beatriz Correa who told us to call her “Bea”. She is a teacher of Maya holistic healing and shamanic Mayan traditions. Bea was dressed in a traditional Maya dress, but from her manner and language she was most likely from the Spanish elite of Merida. She shared with us a bit of her background as she explained her connection to ancient Maya practices. Beatriz explained that her Mestizo nanny first introduced her to ancient Maya herbs. When she moved to this area to be closer to her grandchildren, and her friend ….. who owns the Hacienda Chichén Itzá, she met with Maya elders to told her she had been called to this area and that she was empowered to practice the holistic healing she had been trained for (there is a framed certificate to that effect hung inside the healing room). 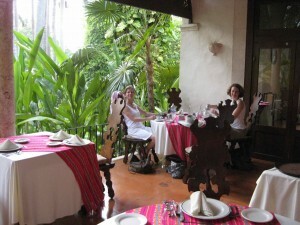 Beatriz owns the building and shares profits with her friend, the owner of the Hacienda. We also met Manuela de Jesus Moo Cocoom and Marcela Noh Hau who were, as Beatriz explained, the grand daughters of Maya healers. According to the website for the Fundacion Maya in Laakeech A.C. (www.yucatanadventurecom.mx/inlaakeech.htm) these women are single mothers who were born and raised in rural Maya communities. On this website, Manuela is quoted: “medicine is a gift of Mother Nature and the Spiritual Realm. . . .My work is filled with positive healing energy, I am honored to be a Mayan [sic] healer and a loving mother. . .I do volunteer at MFIL Toh Boutique [in the Hacienda] its profits help many Mayan [sic] rural children nutrition and education as well as support rural families”. Marcela states on the site that: “At Yaxkin Spa, I have found many opportunities to grow professionally and to achieve economical independence; for a rural woman like me these were dreams I was not sure I could reach”. I hadn’t found this site before we had our healing treatments or I would have asked many more questions. Unfortunately we were told by Beatriz that these two Maya women did not speak Spanish, only “beautiful Mayan”, which none of us spoke. 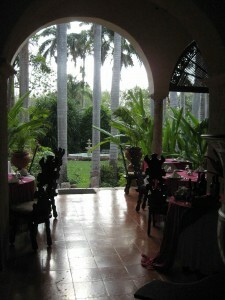 Both Hacienda and Spa “support the Maya communities nearby . . . .to bring opportunities to support rural education, community health care, and preserve Maya traditions” (www.yucatanadventurecom.mx/inlaakeech.htm). We were informed about this dimension of the Spa as we began our ritual. Beatriz explained that the ritual we were participating in was “solamente for healing”; healing the spirit and the body. The room was lit by candles with soft New Age music playing in the background (a mixture of bird song, running water, Native American flute and drums). Three massage tables were prepared and Jo, Jenna and I changed into surongs and reclined face down on our tables. Beatriz paired with Jenna, Marcela took her place at the head of my table, and Manuela joined Jo. The ritual began with Bea inviting the power of the gods and the cosmos to be present and to bring peace and healing to this endeavor. She burned some copal (sacred resin) and all three women began applying oils and honey to our backs. Eventually we were covered with large green leaves that Jenna recognized as an ingredient to many of her Mexican cooking recipes. Marcela also used a large river stone during part of my healing. When we turned over, I glanced at Jenna and Jo as crosses were made on our faces and neck using papaya strips and cucumbers were placed over our eyes. Beatriz placed a flower on Jenna’s forehead, where one might find the ‘third eye’ in many traditions. This yellow blossom grew in abundance on trees in the area. When the ritual was finished and we had changed back to our clothes, it was the men’s turn and Jenna, Jo and I returned to the Hacienda to wait. As we sipped tea and waters, I reflected on what we had just experienced. I knew that it was unlikely that we had just participated in any ritual that could be found in the rural Maya areas, even though Bea claimed that this experience was deeply rooted in ancient Mayan cultures. What we had really found was a syncretism of New Age religious practices found in many parts of the world, especially in the United States. This particular variety borrowed heavily from the local environment; the natural and cultural Mayan worlds. Tourists unfamiliar with anthropological work in the area, or who had not met Quetzil before their visit, would be provided with a glimpse of ‘authentic’ Maya traditions. But these are filtered through the Mestizo layer of society as defined by an educated upper class woman from Merida and her wealthy Hacienda owning friend. 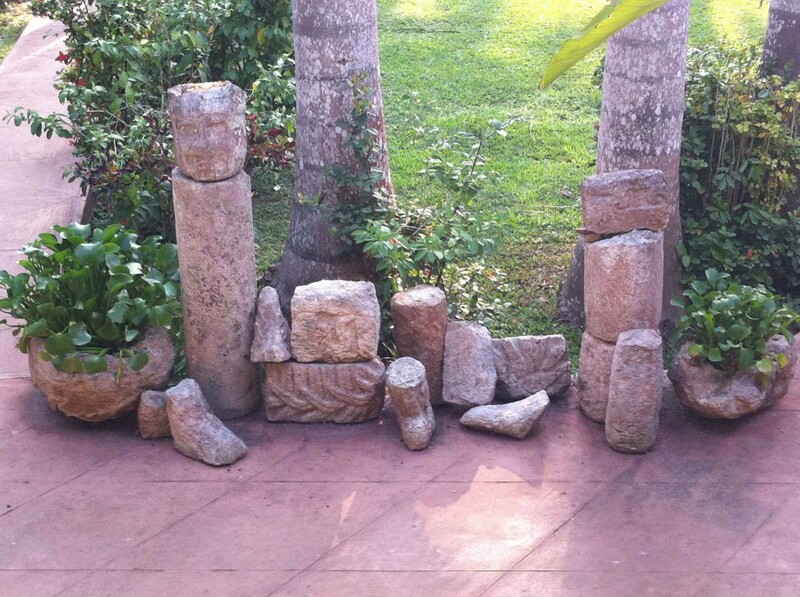 I glanced at the stones and sculptures at the foot of the portico’s stairs into the garden. This was my first glimpse of how New Age religious traditions were permeating tourist visions of contemporary Mayan culture. But it wasn’t the last. Should Mexico Pave This Road? Beth Muellner on Should Mexico Pave This Road? sclayton on Should Mexico Pave This Road? Fair, and 79 ° F. For more details? Partly Cloudy, and 77 ° F. For more details?